The end of near-beer in Utah… “democratic socialism” versus “helicopter money”… subsidized stadia… and more! As we anticipated last year, a major overhaul to Social Security could be coming this year. And Democrats just made the first move. It’s called the Social Security 2100 Act — introduced last week in both the House and Senate. First, a reminder of the two reasons we think a Social Security revamp is due this year. In addition, significant changes to Social Security seem to come the year after a midterm election when the presidency and the House are controlled by different parties. The 1983 reforms were ushered in by President Reagan and House Speaker Tip O’Neill. More modest reforms came in 2015 under President Obama and House Speaker Paul Ryan. Maybe in the current political environment, it seems unlikely Donald Trump and Nancy Pelosi could come to terms on anything. Then again, Trump stood out during the 2016 primaries by saying, “I’m not going to cut Social Security like every other Republican.” Now Pelosi has effectively upped the ante. There are two striking things about the Democrats’ plan. Second, there’s no usage of “chained CPI” to monkey with the annual cost-of-living adjustment. That’s a major change from when Obama and Pelosi thought about tinkering with Social Security in 2011. By adopting the “chained CPI” measure of the inflation rate, the annual COLA would have been adjusted downward year after year. In contrast, the Social Security 2100 Act would adopt a measure of inflation called CPI-E — which would have the effect of raising the annual COLA at a faster clip than it’s rising now. Income taxes on Social Security benefits would be cut for about 12 million middle-income recipients. Right, you’re saying. So what’s the catch? How does all this get paid for? Well, the payroll tax rate would rise gradually over the next quarter-century — from 12.4% now to 14.8%. Seems like a funny thing for Democrats to advocate. The payroll tax has a flat rate that applies equally to about three-quarters of all U.S. households, according to the Tax Policy Center. Indeed, 26.4% of households avoid income tax… but still fork over payroll tax. Uhh, at least not right away. But if you’re a higher earner, you know that $132,900 cap rises with inflation every year. (Last year it was $128,400.) So the doughnut hole would gradually shrink and ultimately disappear. Devious, no? Anyway, that’s the Democrats’ bill. It’s not the last word. But they’ve made the first move. Your move, Mr. Trump. We always take such pronouncements with a grain of salt. The reality is that Uncle Sam lumps your payroll taxes with your income taxes into one big revenue pot that gets spent right away. Your future Social Security benefits depend entirely on the government’s future revenue take. But even with that proviso, there’s probably nothing about Social Security that can’t be fixed without some tax increases, benefit cuts or both. Medicare, on the other hand? Forget it. The entire health care system will blow up by the early 2030s. We’ll probably have occasion to examine that topic anew later this month… but in the meantime you can review our most recent in-depth treatment of the topic here. To the markets… which are grinding their gears as a new week begins. The Dow industrials are up microscopically at 25,086. The Nasdaq is doing better, up a quarter-percent to 2,713. The Nasdaq is up nearly 1% at 7,328. Gold is consolidating its recent gains, down about $3 to $1,313. Crude has tumbled about a buck to $54.21. As bitcoin trades a shade below $3,500, the bitcoin ETF is back in play. “As we noted last week, the people behind a proposed bitcoin ETF withdrew their application with the feds, thanks to the “partial government shutdown.” But with the shutdown on hold for a couple more weeks, our crypto watcher James Altucher tells us the Chicago Board Options Exchange and its partners have resubmitted their plans. Meanwhile James has taken note of an announcement that Fidelity Investments has entered the final stages of testing a cryptocurrency trading platform. The platform, called Fidelity Digital Asset Services (FDAS), could ultimately make crypto trading available to all Fidelity account holders — who hold a combined $7.2 trillion in assets,” James says. “As part of the final testing phase, Fidelity has made crypto trading available to a select group of account holders as it irons out the kinks with its new platform.” A more widespread rollout could come as early as March. For the record: The German government appears to be thumbing its nose at Washington and going full speed ahead with a natural gas pipeline from Russia. For a couple of years we’ve been following the progress of the Nord Stream 2 pipeline project. It would send gas under the Baltic Sea from Russia to Germany. Germany needs lots of gas both to stay warm in the winter and to wean its power grid off coal and nuclear. Donald Trump does not like Nord Stream 2. (Neither did Barack Obama or George W. Bush.) In 2017 Trump signed legislation imposing sanctions on companies involved in financing the project. Trump and Congress would rather have Germany meet its growing gas needs with American-supplied LNG — liquefied natural gas. 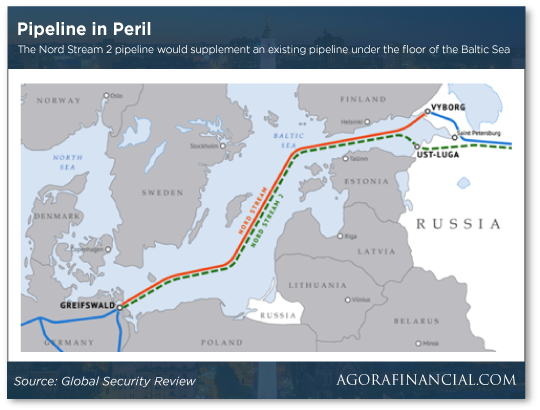 But the latest report from German state media is that Nord Stream 2 is still a go. The “raw” laying of the pipeline should be done by midyear, engineer Klaus Haussmann tells the Deutschlandfunk radio station. For the Germans it’s simple economics. Russian gas via undersea pipeline is cheaper than American gas that’s supercooled into a liquid state, loaded onto tanker ships and returned to a gas state. From the annals of alcohol regulation: Market forces appear to be trumping state law in Utah. “Utah could be moving toward allowing the sale of higher-alcohol-content beer — now available only in state-run liquor outlets — in grocery and convenience stores,” reports Salt Lake City’s NBC affiliate (which is owned by an arm of the Mormon Church, as it happens). It turns out demand for 3.2% beer — “near beer,” as you might remember the term from days gone by — is drying up. National breweries are phasing out production. Oklahoma, Colorado and Kansas have already bowed to the inevitable and changed their laws. Last month, Walmart started urging its Utah customers to call their lawmakers and ask them to do likewise. “Democratic Socialism” reads the subject line of an email from one of our longtime readers, with Alexandria Ocasio-Cortez and her fellow travelers still in the headlines. “Hmmm. As an admission to the upcoming generations that the previous folks screwed it up big-time, it might have some merit. At any rate, better than ‘helicopter money,’ and might give them somewhere to stand as we all muddle through the next three or so crises. “First, get a good working definition of socialism. I’ve heard way too much about the ‘evils of socialism’ where what was being described were totalitarian states that put ‘socialist’ in their national titles, whether or not that was what they were really about. “We need to get the ‘money suckers’ out of education and health care. Particularly health care. Also (and as the now-previous session of Congress may have quite amply demonstrated), we should come to a Winston Churchill-type realization that single-payer universal health care is the worst possible delivery method except for all the others. It will be pointed out, of course, that current implementations of it have had certain problems. Knowing that might give us a leg up on avoiding or minimizing those problems. “Finally, it has been noted many times that college shouldn’t be a ‘got to’ for everyone. Neither should James Altucher’s gig economy. “Dave, is it just me,” writes one of our regulars, “or do the folks at the Bureau of Labor Statistics always seem to (a) conjure up a lot more new jobs than the ‘expert consensus’ anticipates each month, and then (b) subsequently revise these numbers downward — often massively? “Perhaps they know that a dose of quasi-reality doesn’t hurt the markets quite so much when it’s deferred. Anyway, here’s to another (bogus) gangbuster employment number. It will be interesting as always to see how badly it holds up a month from now. The 5: The funny thing is that John Williams, the man behind ShadowStats, says the data collected by the Bureau of Labor Statistics are rigorously accurate. “You know that stadium in Foxborough? It was not subsidized,” a reader writes — somehow conflating our discussion of subsidized stadiums with your editor’s disinterest in the New England Patriots. The 5: Sore winner much? True, Robert Kraft arranged 100% private financing for Gillette Stadium. As it happens, Stan Kroenke is building the Rams’ new stadium with his own money and a loan from the NFL’s other owners. Even then, we’re still looking at some level of sweetheart deals. The Rams will get to pocket some of the sales tax revenue for purchases of food and merchandise inside the new stadium. Meanwhile, Gillette Stadium escapes property tax. But we’ll allow that Kraft and Kroenke are free market models compared with the $700 million taxpayers handed over directly to Atlanta’s Arthur Blank. Well, at least under the deal to build Mercedes-Benz Stadium, Blank retired the debt of the old Georgia Dome. Seattle taxpayers weren’t nearly as lucky; the Kingdome was torn down in 2000, but the bonds weren’t paid off till 2015! P.S. The average Social Security check issued to a retiree totals $1,411 a month. Doesn’t go very far, does it? What if you could collect a much higher amount than that — and more often? It’s totally possible, using the right strategy. See for yourself right here.